The Little Tallahatchie River at New Albany looking from Park Along the River footbridge toward the Bankhead St. bridge. Record rainfall, with more expected this week, has caused damage in Union County and throughout north Mississippi. Some weather watchers have reported 13 inches of rain in Union County so far during the month of February, while forecasts call for more rain this week. Union County rainfall of 10.06 inches in February, 2003, was the previous high rainfall recorded during the last 25 years. The Park Along the River playground, looking pretty swampy. 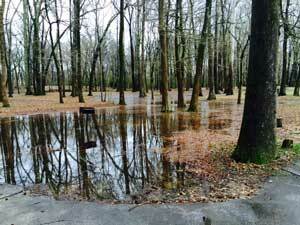 Flooding in the Tallahatchie River bottoms was reported at numerous places in Union County during the weekend. Considerable flooding of the Tallahatchie was reported at Ecru. Portion of Hwy. 15 north of New Albany closed for repairs. Mark Holly, a civil engineer with the Northern District of the Mississippi Department of Transportation (MDOT), told NAnewsweb.com Monday afternoon that damage to roadways in Union County and throughout north Mississippi has been widespread. Holly said one southbound lane of Highway 15 north of New Albany, near Cotton Plant, was closed to traffic Monday because it had “settled” a few inches. He said MDOT did not believe serious collapse of the roadway is imminent, but the lane was closed as a precaution. He said work to repair that small section of Highway 15, about two-tenths (.2) of a mile north of Union County Road 82, would be started Tuesday, February 27. Holly said he could not say for sure that the short section of Highway 15 had settled because of erosion brought on by the recent heavy rains. The section of sunken road is near a box culvert of approximately 8 ft. x 8 ft. that carries water from a small stream under all four lanes and the highway right-of-way. The stream empties into a branch of the Tallahatchie River a short distance west of the roadway. 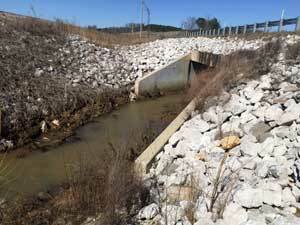 According to the engineer, the worst road damage in MDOT’s Northern District occurred on Highway 178 near Mooreville. It was first reported Sunday evening that a rain-saturated hillside had collapsed and slid down onto the roadway. By Monday afternoon the mudslide had grown to a length of about 300 feet long. There was also a report of a large water main break near the mudslide. Holly said it could take a few weeks to repair the damage. 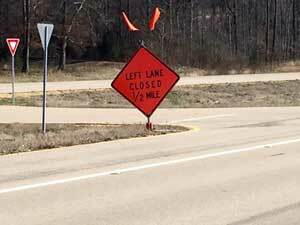 MDOT has established a four-mile detour around the mudslide. The National Weather Service issued a tornado warning in New Albany about 10 p.m. Saturday evening, but it was later reported that only “straight line winds” had occurred. A few trees were reported down in New Albany. However, Bill Mattox, manager of New Albany Lights, Gas and Water (NALGW), said no electrical outages were reported Saturday night. With some forecasts calling for as much as five more inches of rain this week, more damage from flooding and erosion could occur. The Mississippi River is expected to rise above flood stage at multiple places in the Mississippi Delta during coming days.